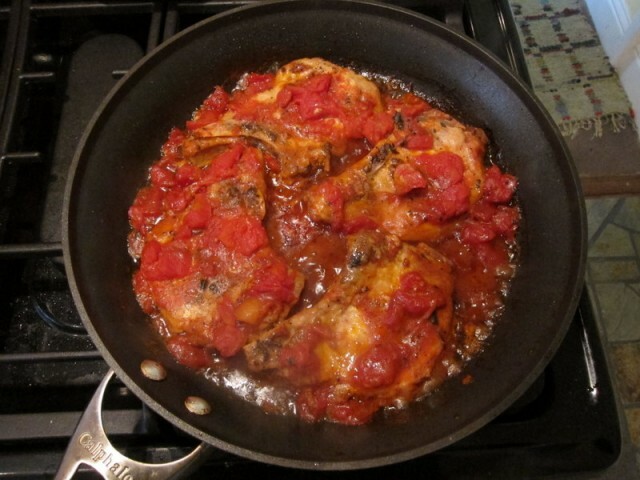 As I may have mentioned on previous posts part of my initial attraction to Italian cooking is that there are many recipes which are both very simple to make and delicious to eat. I know that I have also said that I’m un po’ pigro ( a little lazy). So whenever I find something extremely tasty and delicious I am ecstatic. 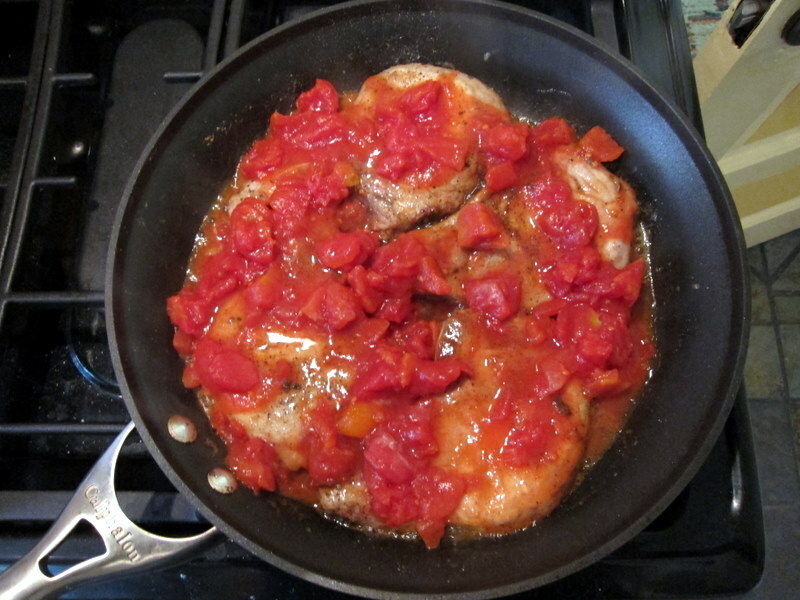 I am feeling that way about the pork chop recipe from the goddess of Italian cooking, Marcella Hazan. 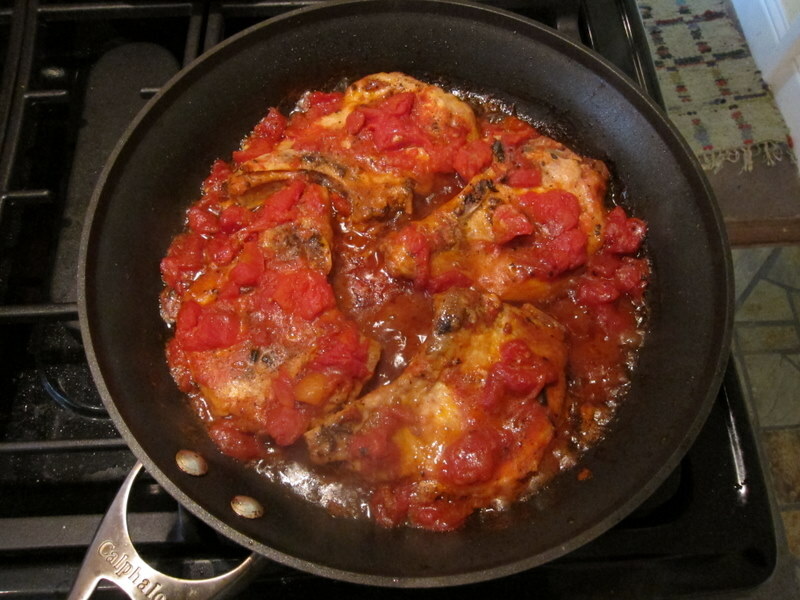 This is from her second cookbook “ More Classical Italian Cooking”. As an aside I have her autograph in it from the time that she was doing a book signing in Oakland. There were lots of Marcella worshipers in line clutching copies of their favorite Marcella cookbooks. But I digress as I often do. So the recipe is called Costolette di Maiale alla Modenese. So it’s pork chops, Modena style. Here is how you go about it. Melt 2 tablespoons of butter along with 1 tablespoon of vegetable oil in a skillet big enough to hold 4 pork chops. I used peanut oil as the vegetable portion since that is all that I had on hand. Why veggie oil? Beats me but when in doubt I go with Marcella’s instructions. As usual a non-stick skillet is easier to clean so I recommend that if you have one but the first time I did it in a regular pan and the cleanup is easy if you soak it in water overnight. 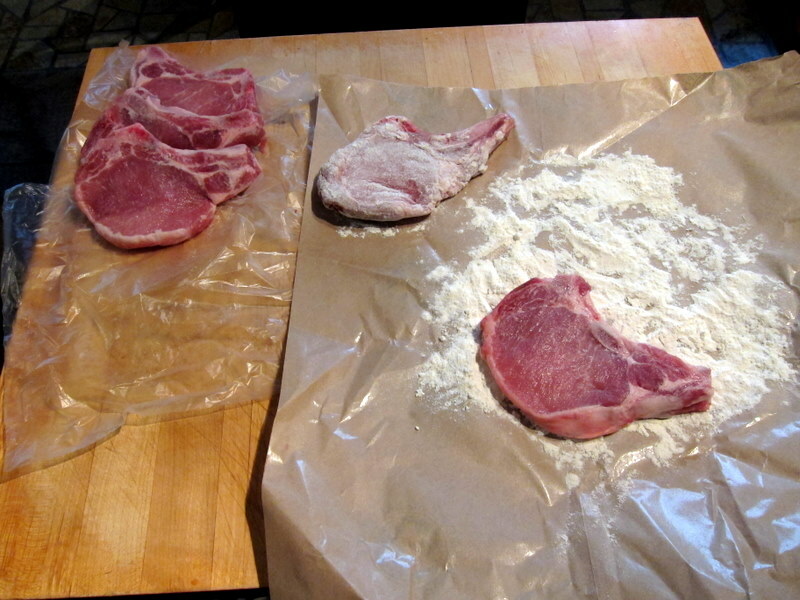 While the oil is heating bread the chops with flour. Since I’m a little pigro (sensing a pattern here?) I use the wrapper for the meat as the surface for breading. No cleanup required, just throw it away. When the butter stops foaming add some dried sage. She says 3 or 4 leaves but since mine comes already crumbled I just put in what seems like it would be that amount. Next brown the chops on each side. It only takes 2 or 3 minutes per side. 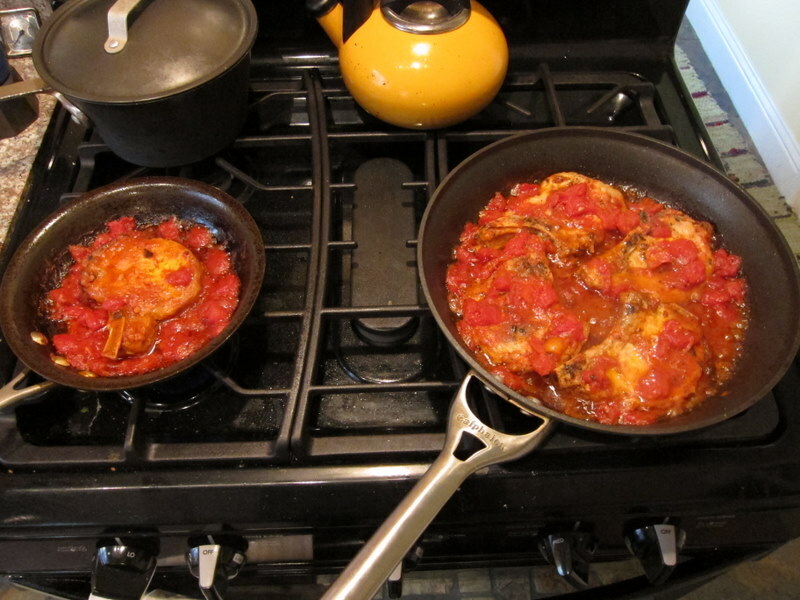 When the chops are browned add 3/4 cups or, heck, more if you want of canned chopped tomatoes along with a little salt and pepper. Cover the pan, reduce the heat so that it simmers and cook for an hour. 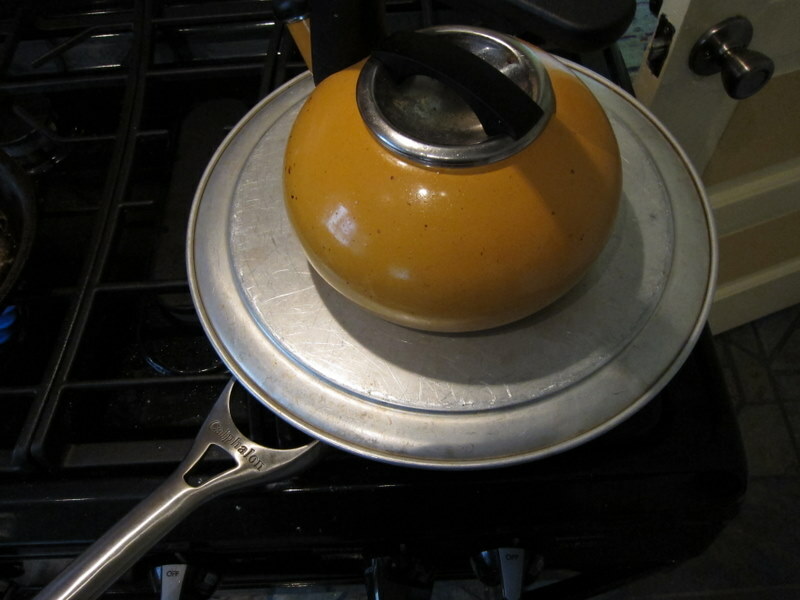 I didn’t have a lid big enough for my big pan so I improvised. A pizza pan with the kettle on top was perfect. I also was a bit optimistic about being able to fit 5 chops in the pan but the recipe is so easy that I just did the last one in another pan. Same results. That’s it! The chops are tender and the sauce is amazingly good. The first time I did it I didn’t have chopped tomatoes and used crushed tomatoes. 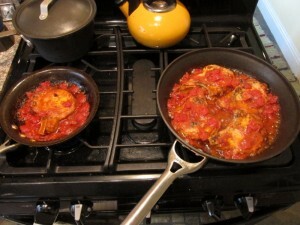 This was one of those lucky accidents where the results were, I thought, superior to using chopped tomatoes. Now that I’ve tried it both ways I definitely recommend the crushed. You will roll your eyes heavenward when you taste the sauce. I could (and did) it it with a spoon while making satisfied noises. This entry was posted on Sunday, April 17th, 2011 at 7:10 pm	and is filed under Food. You can follow any responses to this entry through the RSS 2.0 feed. You can leave a response, or trackback from your own site. Wow! This sounds great! 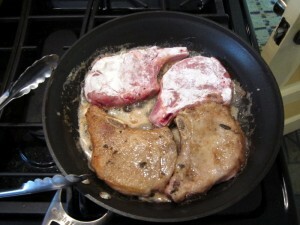 I’ve just decided these pork chops are what’s for dinner tomorrow. Thanks! Let me know how it turns out. The next time that I do it I will definitely used crushed tomatoes and probably a more generous amount than Marcella calls for. She says 3/4 cup for 4 chops and I put in the whole 12 oz. can. Yum. Oh Yeah! Fixed these chops last night, and they were GREAT! No left-overs. I am out of dried sage, and my plants aren’t big enough to use just yet, so I used thyme instead. I suspect oregano may have worked well also. In any case, the meal was fast, easy, and a huge success. Thanks Joe, for the recipe! I’m so glad that they worked out for you. I’ll have some more recipes coming before long but want to do a couple of not food posts first. We use vegetable oil because northern Italian cooking (as in Modena) is traditionally based on butter (or pork fat). For this reason, if you want a really authentic ragu bolognese you never, ever use olive oil. Thanks for the comment, Mike. All of the recipes that I’ve seen do indeed use olive oil including what I believe to be very authentic ones. Certainly recipes can be quite regional and even though Modena is only about 30 miles from Bologna (which is after all the epicenter of ragu) I can imagine differences. Most of the recipes that I’ve followed also use milk but even in Bologna opinions vary considerably on that point. So, I’ll continue to use olive oil and milk. Sometimes I use pork as well as beef as well. 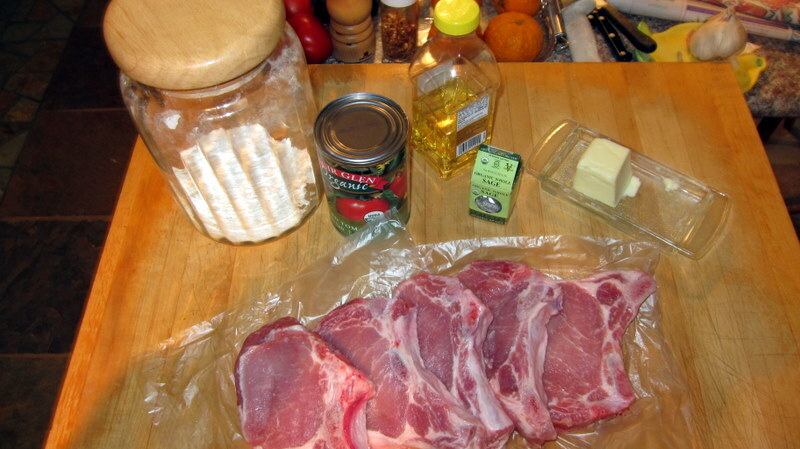 Years ago I found a recipe for Pork Modena in I believe Woman’s Magazine. I remember it having white wine,sliced tomatoes,chicken stock and Basel. It was so good it was unbelievable. VI can not remember all the prep procedures. Have you ever heard of that dish being prepared that way? Wow, I haven’t been paying much attention to my blog when in California so sorry to be so late with a response. No, I haven’t heard of that preparation but I just happened across this recipe in a book by Marcella Hazan (the goddess of Italian cooking in the US – at least in terms of cookbooks). I must admit that I find American recipes for Italian dishes often suspect. I usually turn to Italian ones. I can read enough Italian to use them. They are usually simpler and rarely use butter or cream which are ingredients used all too often in American interpretations. You can always look for them by Googling with the added word of ricetta at the end of the query. For example “Stufato d’agnello ricetta” – lamb stew recipe. Or something simpler like “ragu bolognese ricetta”.